I admire my mother's energy and my father's passion for things he enjoys. I absolutely adore my home. But my kitchen is probably my favorite part. It is centered around a wonderful stove -- rescued by my builder from a restaurant that went out of business. 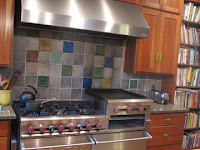 The backsplash above it is patchworked with tiles from Pewabic Pottery. The cabinets are solid cherry, Amish -made in Shipshewanna (and less expensive than ones from a big box retailer). The floors are cork -- great on your feet. The countertops around the outside are lovely green/grey/black granite. The countertop on the island is locally made maple butcher block. And I collected the knobs on the drawers for years before I had this kitchen. They're all vintage bakelite knobs and drawer pulls. 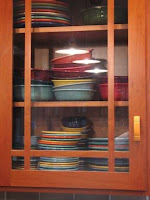 My collection of Fiestaware peeks out from behind glass-fronted cabinets and adds my favorite colors to the kitchen. Can you tell how much I love it all?